In preparation I have made some swaps, this is a tradition of these events where Demonstrators make little things that they swap with other demos. These are then intended to give inspirations and ideas for thank you gifts, class makes, make and takes etc. 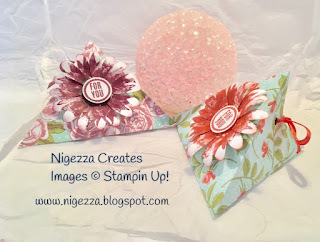 Stamping Up is all about sharing creativity, sharing what we love to do and inspiring others to create. I have made little triangular no glue gift boxes that hold a small square of chocolate but could easily hold jewellery. There is a video tutorial as usual on my YouTube channel here but it does not go into too much detail about the construction of the box as I have previously done that in another tutorial. This tutorial shows the way the box was decorated. I had planned this to be a very quick and easy inexpensive gift box however it involves 2 step stamping and punching out (2 of those) another punch out element and a die cut as well as a ribbon that is tied in a bow! not so quick after all and when doing 75 of them I used a lot of ribbon! Oh well I enjoyed every minute of it and can't wait to see what I get in return! I will of course be showing you al what I got sometime next week. The link for the original post about how to make the boxes is here. This box is a little smaller, I used Petal Garden 6x6 paper, I cut 2 pieces from each sheet - 5x3 - so I have loads of 1x6 inch strips that I need to find a project for! So if you were making wedding or party favours you could get 96 out of a 6x6 paper stack. For the decoration I used a 6/7 inch length of ribbon, I used the Sheer Ribbon that coordinates with this paper. I did use the Blends to colour some of the Whisper White in Rich Razzleberry, I also used the Old Olive colour as well. There were 3 colours in the papers that I coordinated with card stock and ink - Rich Razzleberry, Sweetsugar Plum and Calypsos Coral. 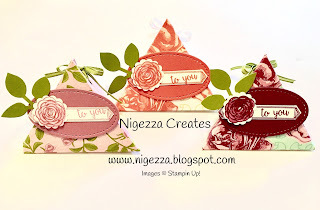 I used the Stitched Oval Framelits as a background to the topper, the Leaf Punch to punch out Old Olive Leaves, Happy Birthday Gorgeous to stamp sentiment and the Label Punch to punch it out. I really hope those who received this swap liked it and they find it useful.